WeedGuardPlus fortified products can improve soil quality and can boost yields with no additional time and effort on your part. See below for options that have been fortified with key nutrients that are naturally released into the soil. the fertilizer in the WeedGuard, allows it to percolate through to the soil after irrigation or natural rainfall. A win win for all your plants. Fortified with calcium to strengthen plant cell walls, reduce calcium deficiency, and address soil salinity problems. Enriched with humic acid which may aid in micro-nutrient availability. Enriched with humic acid, may aid in micro-nutrient availability. 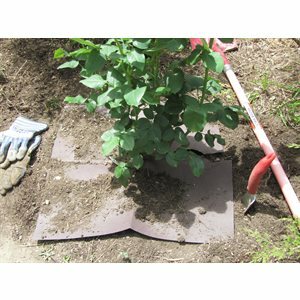 Sheets allow for easy application around existing plants.